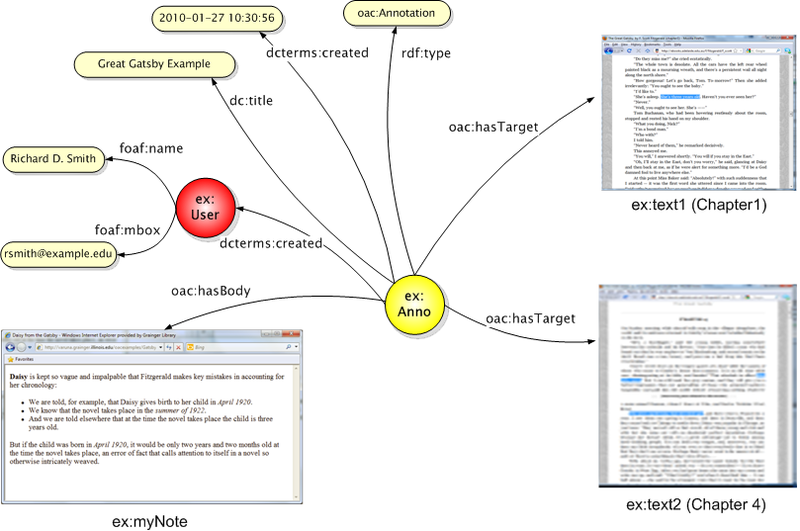 examples of Annotations described according to the OAC Data Model and using 2 chapters of an XHTML digitized version of the Great Gatsby as Annotation Targets. 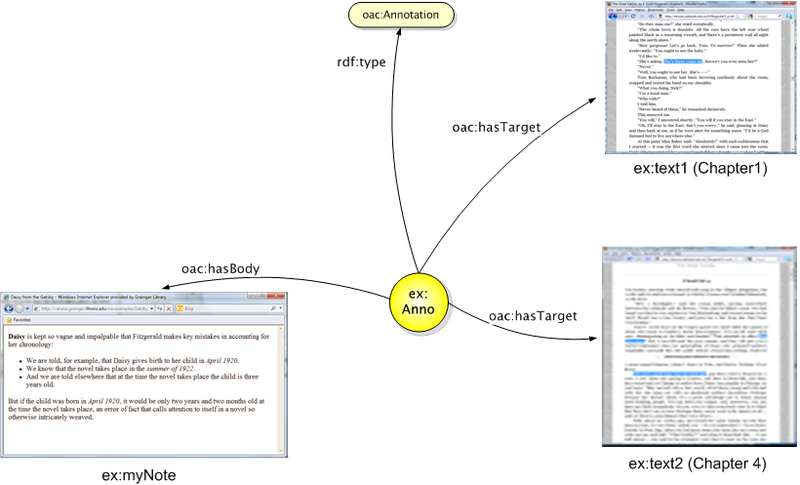 These illustrations of annotations described in accord with the OAC data model use text snippets from chapters 1 and 4 of an XHTML version of the Great Gatsby as annotation targets. 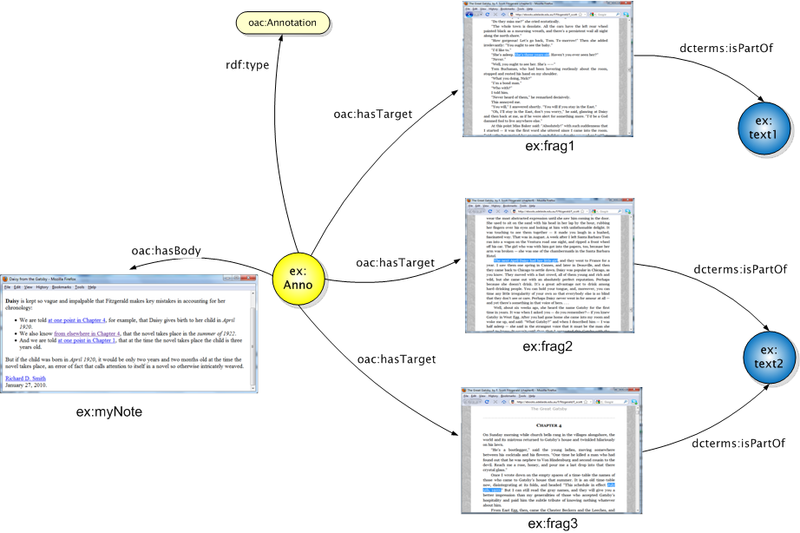 The XHTML of each chapter is a separate resource (separate URI), so these examples illustrate how the OAC data model can be used to describe annotations having multiple targets. 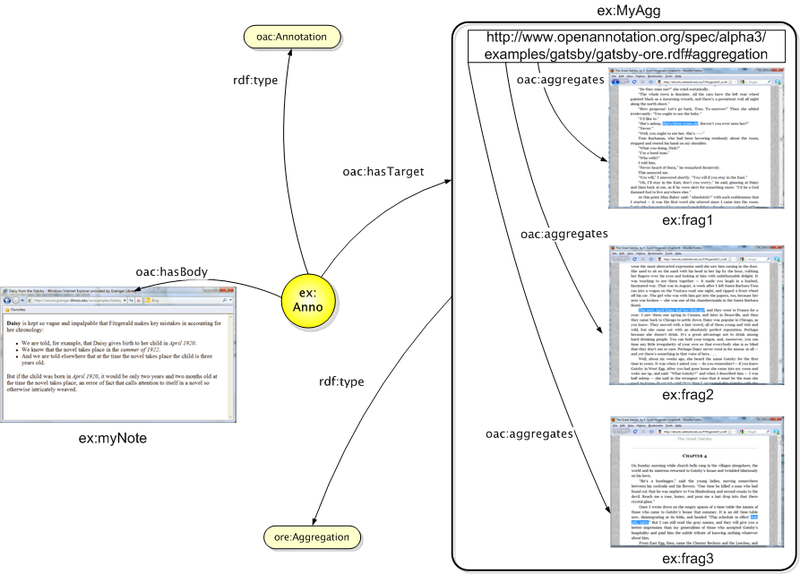 Some of these examples also illustrate annotations that use XPointer Fragment Identifiers as part of target URIs, and one illustration shows the use of an ORE Aggregation as the annotation target. The annotation bodies used for these examples are snippets of XHTML. In some of the serializations given below, that annotation body is given inline within the annotation serialization. Links to RDF/XML serializations and in one instance an RDFa serialization are provided. These annotations target specifically a single XHTML manifestation of the Great Gatsby and so do not address issues of targeting text of the novel at expression or work level. These illustrations were inspired by a brief passage from Lehan, R. D. (1990). The great Gatsby: The limits of wonder. Boston, MA: Twayne Publishers. (With apologies to Prof. Lehan.) Suggested for use as an illustration by Kevin Trainor. A user creates an annotation of the Great Gatsby. The Annotation Body (content of the annotation) is instantiated in XHTML format. The Annotation Body compares snippets of text found in 2 different chapters of a particular XHTML-digitized manifestation of the novel. We can add extra properties and relationships to the resources involved in the Annotation. 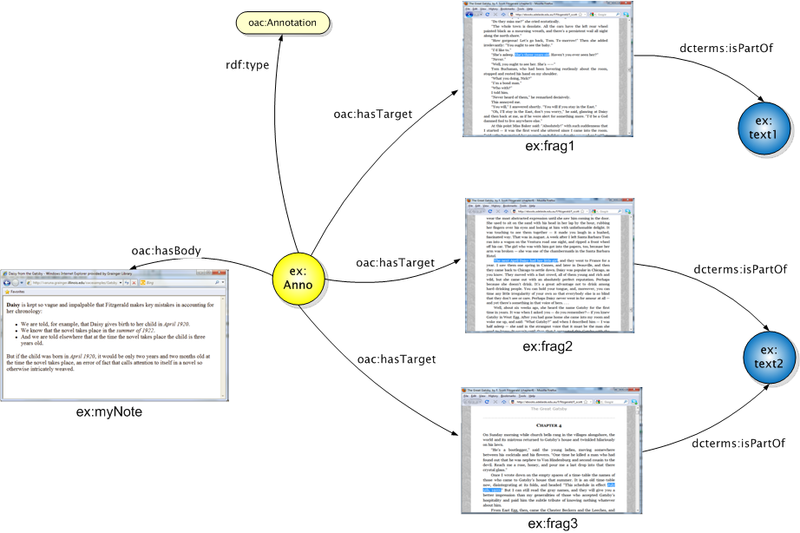 More specific Annotation Targets can be expressed appending XPointer Fragments to XHTML Chapter URIs. This leads to an annotation with 3 Targets rather than 2. 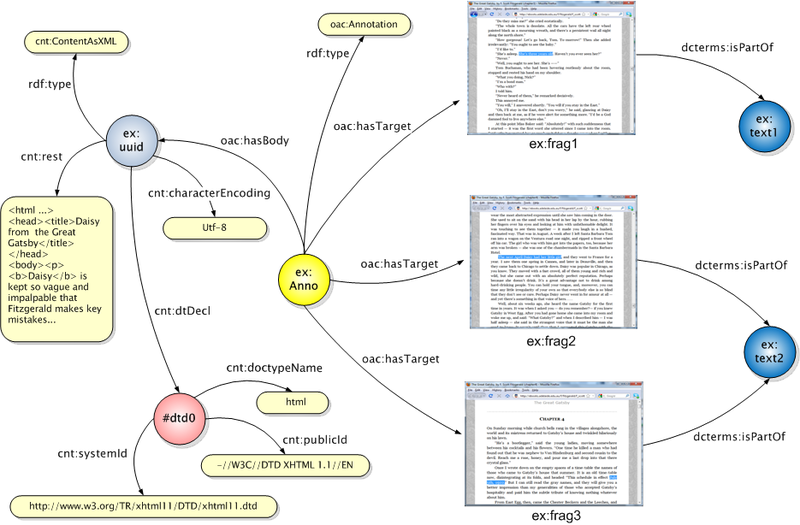 The RDF for the Annotation described above can be seralized as RDFa included in the XHTML containing the Annotation Body as illustrated here. Note that the Annotation in this illustration is identified using fragment identifiers; this is convenient if including multiple Annotations in a single XHTML+RDFa instance. The Annotation Body is identified using a fragment identifier as well. Using a RDFa distiller, the RDFa for this example can be extracted and serialized as RDF-XML, Turtle, or N-Triples. cnt:rest "<html ....><head><title>Daisy from the Great Gatsby....</html>"
We are told in Chapter 4, for example, that Daisy gives birth to her child in April 1920. We also know from Chapter 4 that the novel takes place in the summer of 1922. And we are told in Chapter 1 that at the time the novel takes place the child is three years old. Read in sequence, this makes obvious a mistake in the chronology of the narrative that is otherwise obscured to the casual reader reading in narrative order. If the child was born in April 1920, it would be only two years and two months old at the time the novel takes place, an error of fact that calls attention to itself in a novel so otherwise intricately weaved. Given this Annotation Body it would be reasonable to describe the Annotation as targeting not 3 individual text fragments, but rather a single ordered set of text fragments. Accordingly, an ORE Aggregation would be a reasonable option as Annotation Target for this Annotation.